If we have five stocks selected, do we buy an equal number of shares of each? That would work if the stocks sell for the same price. Then we would be investing equal amounts of cash in each security. However, we are generally purchasing equities of different market values. How then do we calculate how many shares to purchase and how many contracts to sell? Stated differently, how do we allocate our cash? Once determined we can then sell our covered calls. With nine stocks and $100k, we approximate $11k per stock. Next we divide the price per share into $11k and get the number of shares we can purchase. Since 1 options contract = 100 shares, we must round off to the nearest one hundred. If the number is near the middle as it is with FFIV, I will round up or down based on previous experience with that security or on the technical status of that equity. Next I will multiply the number of rounded off shares by the price per share and calculate the total cost to purchase all shares. In the above chart, that comes to $96,780. I do this for two reasons. First I want to make sure that I can pay for all these shares and don’t go over my $100k budget. Second, I want to be sure that I also have extra cash left over for possible exit strategy execution. In the above example, $3220 is the cash balance, quite adequate. We take this information together with the calculations computed by the Ellman Calculator and sit down in front of our computer and start generating cash! Note also that with the exception of XEC, we sell more than one contract for each stock. That will allow us to “ladder” our strikes if we so choose. In other words, for an equity like PAY we can sell three O-T-M strikes and two I-T-M strikes or some other combination depending on our market outlook. If we were extremely bullish on the market and stock technicals were impressive and confirming, we may opt for five out-of-the-money contracts. When creating our covered call portfolio stock and industry diversification is critical as is cash allocation. This way, no one stock or industry will impact our portfolio in an extreme manner. A warm welcome to our new members including several from Australia. In 2012 we plan to expand and enhance both the general and premium sites as we continue to maximmize the quality and organization of the content we provide to our members. Thank you to ALL our members for the confidence you have shown in our BCI team. For the week the S&P 500 rose by 0.9% for a year-to-date return of 1.8% including dividends. BCI: This site continues to take a defensive posture and sell mainly in-the-money strikes as long as global issues remain the determining factor in market direction. How do you determine how much cash you reserve for exit strategies? Thanks for this helpful information. Generally you should keep enough cash to buy back the call option. If you don’t have that much in reserve, you can often call the broker and ask them to close the entire position. If they buy the option, and sell the stock at the same time, they know that the cash will be there to cover the shortage in another day. To expand on Owen’s remark: A useful guideline is to set aside 2% – 4% of your total portfolio value for potential exit strategy execution. In the example used in this article for a $100,000 portfolio, a reserve of $2,ooo to $4,000 will suffice. Remember, you can achieve diversification if you use exchange traded funds. For a refresher, click on the “exchange traded funds” link to the left. 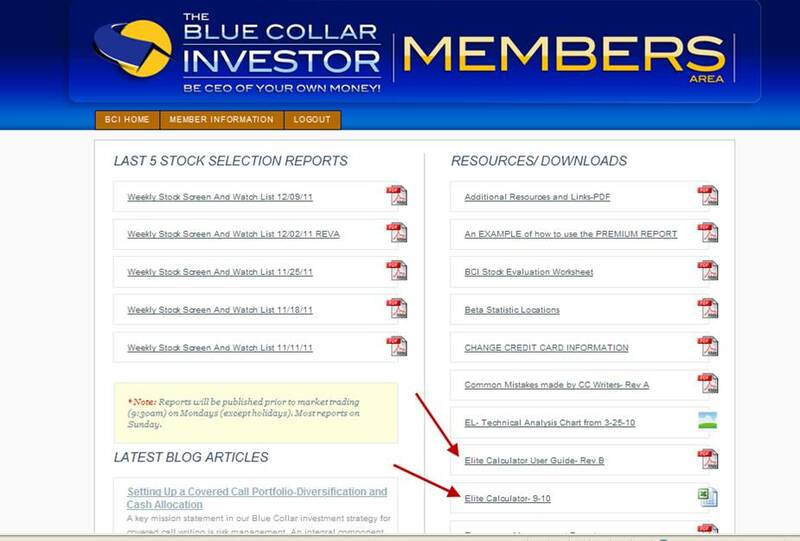 You wil find several discussion of how to use ETFs for covered calls. The profit may not be quite as high as some individual stocks, but the risk is lower. It will also allow those with only $5,000 or $10,000 the opportunity to get a better return on their investment. Some of the ETFs are a bit on the expensive side, but they will allow you to diversify with one “stock”. SPY (the S&P 500) is over $126 per share, but QQQ (the Nasdaq 100) is only $57. Some of the ETFs have a feature which other stocks do not. Some of the ETFs have options which expire on the calendar quarters, as well as monthly. So, you could buy SPY and sell a December 31 call, which still has three weeks left. Good diversification goes way beyond your narrow consideration of solely U.S.-based stocks. Good asset allocation also incorporates international stocks, bonds, real estate, and commodities. As John Templeton taught us, to really practice diversifiation, we must transcend home-country bias and take advantage of the wide world of covered calls investing opportunities to achieve significant long-term outperformance. The Weekly Report is now available for download from the Premium Member’s website. Our database of screened stocks consists of between 2000 – 3000 stocks with options that trade on US exchanges. As you know many of these equities ARE international, commodity and real-estate based. We also use and publish weekly reports concerning ETFs that also meet Mr. Templeton’s stated requirements. We screen our stock and ETF database WEEKLY. Basically, I believe that we are in agreement regarding appropriate diversification. Thanks for your responses and Alan thanks for pointing out another way to use the stock report. There are several stocks on this weeks list that have nice dividend yields like OKS and MCD. What do you think about favoring these stocks when setting up your covered call portfolio list? I just wanted to thank Allan and the BCI team for fixing the color problem in the ETF report. That’s what I call customer service!! What are those requirements ? I was responding to the comment that John Templeton suggests investing in securities outside of US, home-based stocks. In addition to several of the the equities on our premium list, many of the ETFs in our weekly reports also include exposure to commodities, real estate, international companies and the bond markets. When it comes to diversification, these comments are preaching to the choir. We added % dividend yield information to our premium watch list as a result of many members expressing their preference for these equities. I always run my calculations on ALL equities that I am interested in and then I will favor those with dividends from the list of stocks that meet my financial goals (2% – 4% in normal market conditions). It is a factor but not a primary one. I recently started the premium subscription but can’t find the location of the Ellman calculator. Please help. Look in the “resources/downlaods” section of the premium page which is on the right side. Look for “Elite Calculator and the user guide. See screenshot below (click on image to enlarge and use the back arrow to return to this blog). I’ve been using this stock for several months with excellent results. It still looks strong both fundamentally and technically. Good luck. BBY has lost 14% of its share value today after a disappointing earnings report. You will note that BBY also is one of our “banned stocks” because it also reports same store monthly sales stats. Also I understand what to do in rising mkt but what would be done in falling mkt like now.Pl help. Welcome to the BCI community. If you have my latest book (Encyclopedia) check out chapter 11. Keep in touch and let us know how you’re progressing. I believe what you asked was how much capital would you need to generate $15,000 per month in income. If this is correct, then you would need between $750,000 and $1,500,000. 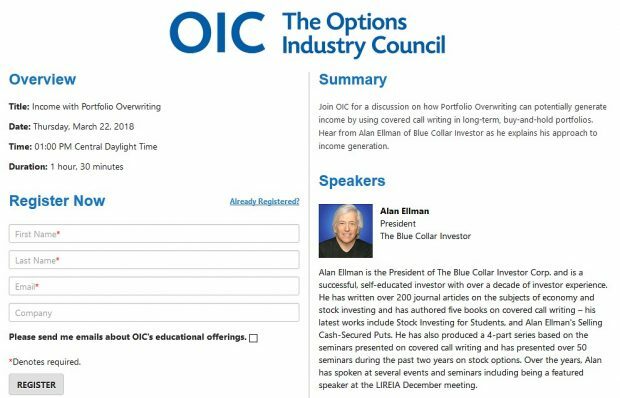 The covered call writing that Alan and the BCI does generates between 1% and 2% per month. You also need to remember that this is not a sure thing. There may be months when you cannot find sufficient investment choices to invest as you would like. There will also be months when the market does not go your way and you have to get out early with a lower gain than you hoped for, or even a loss on some positions. This is investment income. It should not be relied on for income needed for monthly living expenses. 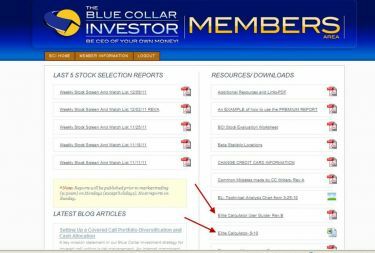 Welcome to the BCI and good luck with your investing. If a company declares or increases a dividend does it have any effect on the option value? A normal dividend generally does not effect the options. A special dividend, or a stock dividend, can cause a an option to be adjusted. A company going from a forty-five cent dividend to a forty-eight cent dividend will not change the options. Has anyone heard the term “parity graph”. I heard it mentioned on a financial radio program and can’t find any information. In general, an increase in dividend will decrease call option value. That is because owning the stock will have an added value compared to owning the call option. An increase in interest rates will have the opposite effect. By increasing the “cost to carry” or opportunity lost when interest rates rise, call value will increase. Both factors are minor when it comes to establishing call premium value. Time to expiration and implied volatility are the major factors. This is a chart that shows profit/loss @ expiration when the option is trading with no time value or @ “parity”. Slightly expanding Alan’s explanation in (#25), a parity graph can also be defined as a risk graph…similar to what you see in some specialized charting programs. A no-cost way to generate risk graphs for your trades is to open a free virtual trading account on Think Or Swim, Options Express, or most any stock broker that specializes in options. These firms offer risk graphs as part of the trade analysis software that they offer on their trading platforms. Al;though the article focuses on cash secured puts, they show a risk diagram and use the term “parity graph” in the article. Thanks for your responses and for providing us with such a valuable site. OIS announced a stellar earnings report on November 3rd with earnings @ $1.67 above the estimate of $1.48. Revenues rose by 53%. Earnings growth in 2011 is projected to be 75% and 21.4% in 2012. This stock trades at a forward PE of 12x below the 15x mark for value stocks. The price/book ratio is 2.0 below the 3.0 mark for value stocks. Our premium watch list shows an industry segment rtank of “A” up from “B” last week and a high beta of 1.76.